St. Joseph’s Hospital holds a special place in Charlene “Pinky” Harris’ heart. 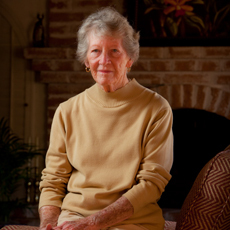 She worked in the hospital as a nurse when she first moved from Iowa to Phoenix in the 1950s, and it was the first hospital of choice for both her husband, Keith Harris, MD, and his father, Karl Harris, MD. So when the time was right, Mrs. Harris gifted the annual distribution from an IRA account to pediatric services at St. Joseph’s in honor of her husband. “I love children,” Mrs. Harris says. “And I just feel that St. Joseph’s is an excellent hospital." While working at St. Joseph’s, Mrs. Harris became acquainted with Karl Harris, a general surgeon. Dr. Harris offered her a job, and thus began a long relationship that touched her not only professionally but also personally. Dr. Keith Harris entered her life when he and his children, Karen and Kevin, moved to Phoenix after his residency in Iowa and joined his father’s practice. His wife had died at an early age, and soon Charlene was helping care for his children. In 1982, the two were married. “We knew each other right down to our fingernails, working together like we did,” she says. Dr. Keith Harris died in September 2004. Mrs. Harris remains in their home surrounded by the memories of their life together. Mrs. Harris made a gift to the hospital in the form of an annual distribution from an IRA account in honor of her husband.